The other day I was in Cleveland, OH on business. As we entered the downtown area in our taxi we were confronted with a large billboard with a disturbing image. One of Nike’s hot endorsement deals is with LeBron James, the star player for the NBA’s Cleveland Cavaliers. This billboard is a celebration of LeBron’s MVP season last year. 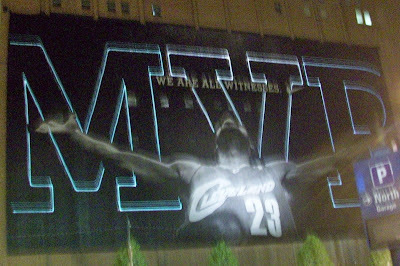 The text on the billboard is “We are all witnesses.” Having just used Peter’s sermon in Acts 2 as a sermon text last Sunday, these words were very familiar, and LeBron’s pose has a disturbing similarity to what Peter refers to himself and the others of the twelve apostles having witnessed. This entry was posted in Meditations, Popular Culture. Bookmark the permalink.